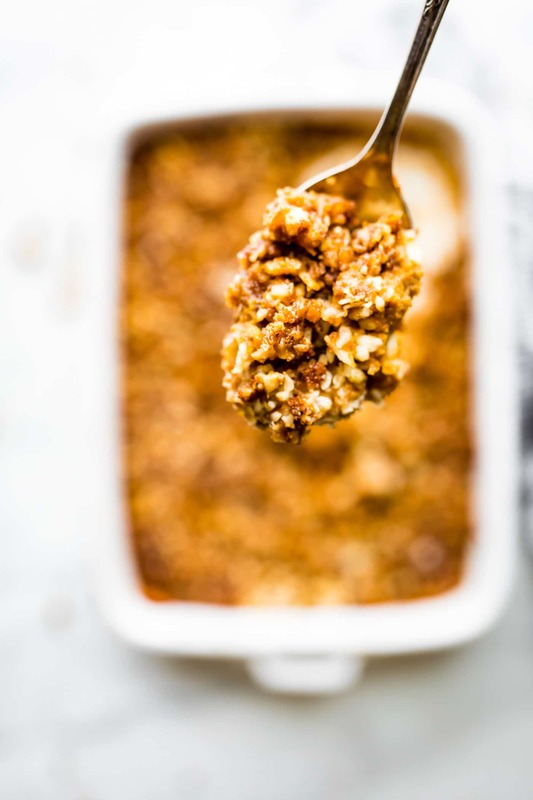 Paleo Pumpkin Sweet Potato Casserole with Macadamia Nut Crumble! A healthier version of the southern classic side dish. This Pumpkin Sweet Potato Casserole has a lightly sweet buttery taste with a crunchy nut topping. 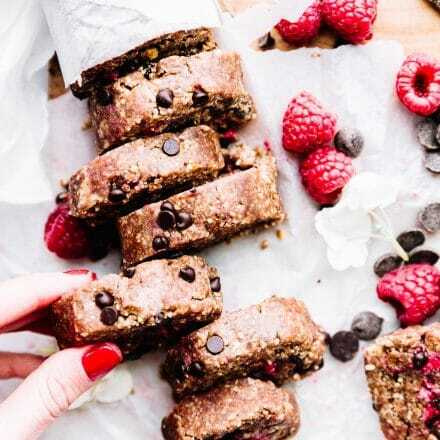 Grain free and paleo friendly! Simple to make in 30 minutes . Happy October! Today I’ve partnered with Simple Mills. to bring you this Pumpkin Macadamia Nut Sweet Potato Casserole. We are thankful for their wonderful Paleo friendly products and allowing me to create and share a healthier holiday inspired recipe. Ohhhhh so thankful! Yes, it’s October and I can finally post about Pumpkin, thank goodness! You see, that’s my rule, I don’t focus on the pumpkin palooza until October shines it’s bright orange smile. AND…. IT….. IS….. HERE! 🎃. But also, Canadian Thanksgiving is October 9th 🍁 , so we better bring on the thanksgiving dishes as well, right? Hence this Paleo Pumpkin Macadamia Nut Sweet Potato Casserole. All things October-ish, Thanksgiving-ish, and Fall-ish! You see, this Sweet potato casserole recipe is originally adapted from an original family holiday recipe, passed down from generations. Similar to my family’s hot fruit bake, it’s a recipe that requires just simple ingredients, yet is sooooo tasty. Albeit, not necessarily healthy. We will get to that solution in a minute though. My mom’s been making her famous sweet potato casserole for years. The original casserole recipe is loaded with sugar, margarine or crisco (gasp! ), candied nuts, and of course marshmallows. I’m not really sure why it’s even called a side dish. It’s definitely more dessert, like sweet potato pie and pumpkin pie combined! Every kid’s dream “vegetable” side dish, right? Ha ha! But you see, over the years, our family has developed certain dietary preferences. We, of course, eat gluten free and mostly grain free recipes. My niece tries to stay clear of dairy and/or lactose. My Uncle feels better on a lower carb/sugar diet. And, well, my parents just try to eat healthier when they can. You can see where I’m going with this, right? So many dietary preferences to accommodate to, or at least try to! It was time to revamp that original sweet potato casserole recipe. 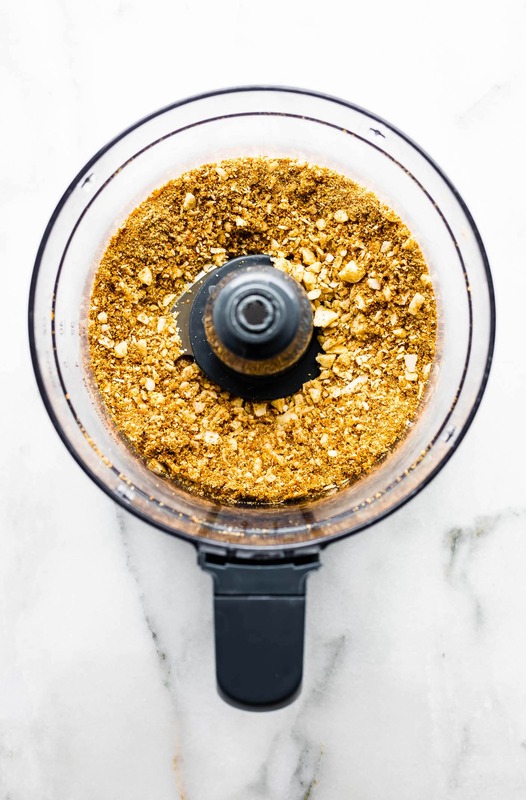 Give it a little healthy boost, maybe even an extra dose of beta-carotene, and in someway somehow make it grain free, dairy free, and paleo-ish! Or in another words, make it more health conscious friendly for all. And that’s exactly what I did with this paleo pumpkin mac nut sweet potato casserole. A buttery, sweet, perfectly delicious sweet potato casserole made with simple ingredients and unrefined sugar. Totally crowd pleaser for your holiday table. I may be bias. So, let’s dig a little deeper here. 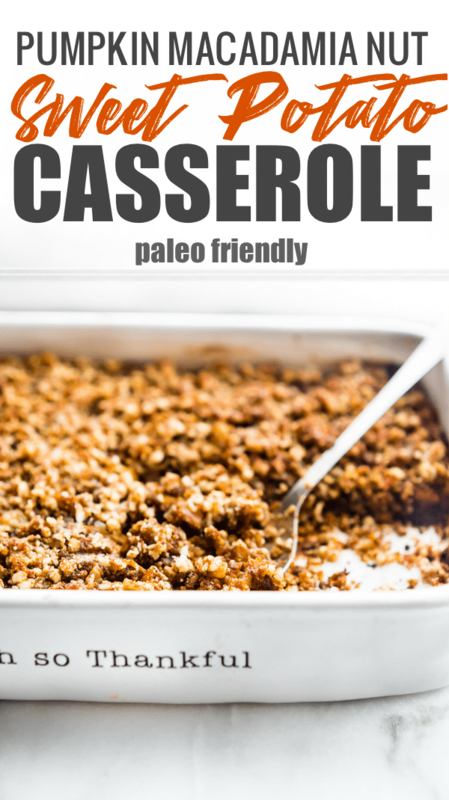 How is this paleo-ish holiday casserole possible??. SIMPLY because of Simple Mills. See what I did there? Yup, Simple Mills Almond Flour mixes is a true holiday recipe LIFESAVER ya’ll! 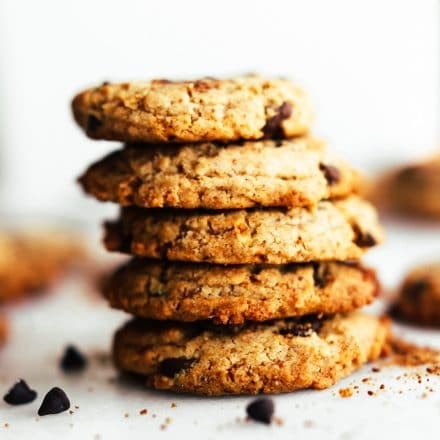 Their mix is made with almond flour, holiday spices, pumpkin, and a little bit of coconut palm sugar. What I also love about this Simple Mills products and Almond Flour mixes is that there are no additives. Just real ingredients. For this “healthified” holiday recipe, I swapped out the original white flour and excess white sugar needed and replaced it with Simple mills Paleo pumpkin bread mix. 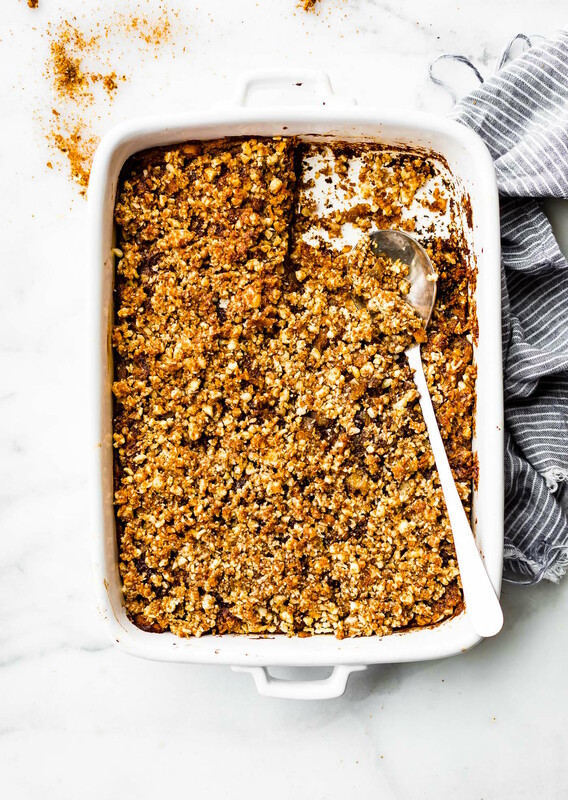 It added the perfect spice and sweetness to the base of the casserole, not to mention the macadamia nut crumble topping. Like whoa, magical! 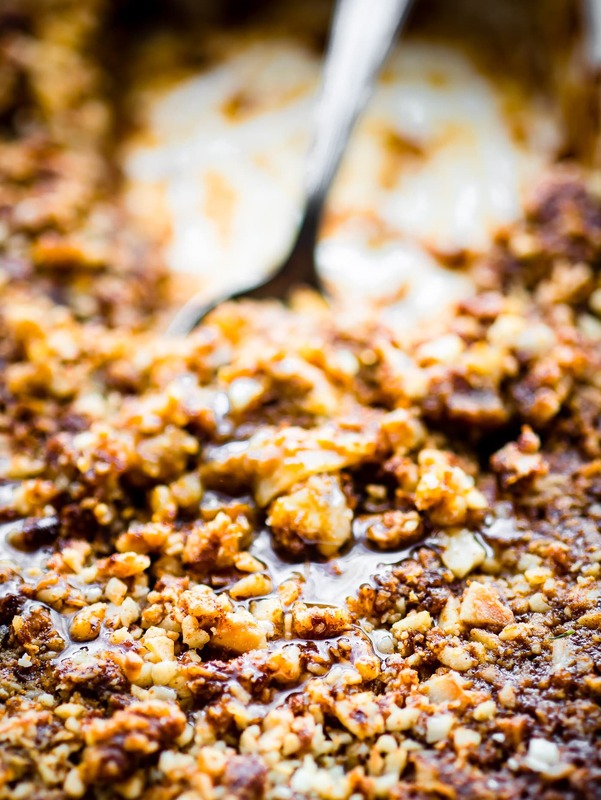 Speaking of that macadamia nut crumble topping…. you can thank my trip to Hawaii for that. I fell in love with macadamia nuts all over again! Gah, they truly are buttery and delicious, especially on desserts. Now you know how this whole Recipe development came together. 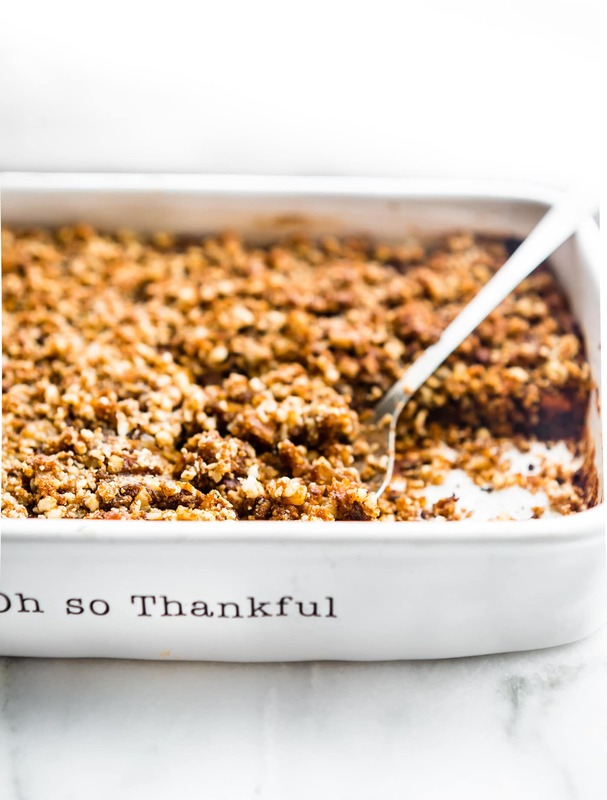 What I really meant to say is that this paleo pumpkin macadamia nut casserole is made with so much love! My corny holiday emotions are wrapped up inside each ingredient. 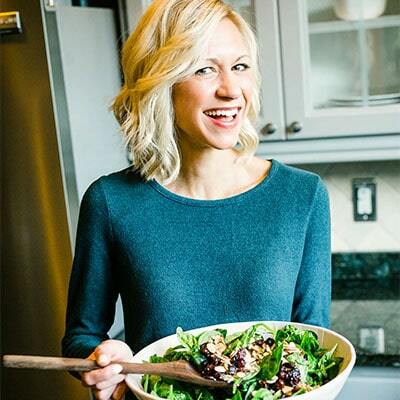 And my hearts desire is for you to be able to share and enjoy a healthier holiday dish with your family too. There are just 10 simple ingredients you need for this dish. You ready? 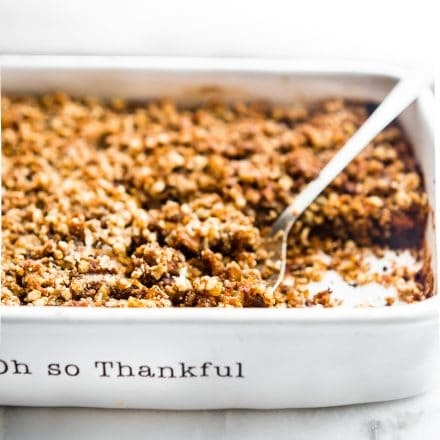 Pumpkin Sweet Potato Casserole with Macadamia Nut Crumble! A healthier twist on a classic holiday side dish. Paleo friendly with a buttery light taste! Remove from oven, then make topping. 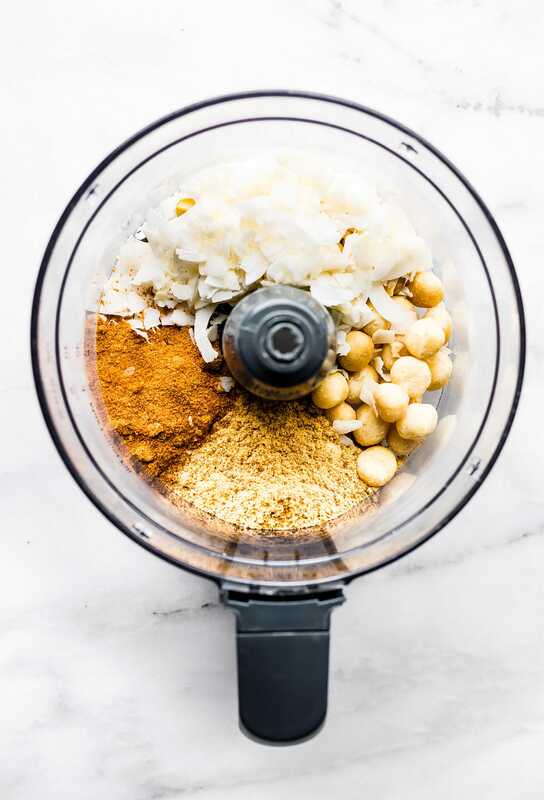 Combine mac nuts, flour mix, coconut sugar, and coconut in food processor. Pulse until a crumble topping is formed. Pour into a bowl and add melted butter or non dairy butter. Mix together. If you want to use coconut oil, see notes. Spread topping on baked casserole. Return to oven for 8-10 min or until golden brown. If edges start to brown quicker than the center, simply cover with foil and until center is pieces of the crumble are browned as well. We use Simple Mills Almond Flour Pumpkin Bread mix. If you don’t have that available, I suggest checking out their other almond flour baking or cake mixes. Just add in a touch of pumpkin spice and 2 tbsp or so of coconut sugar. 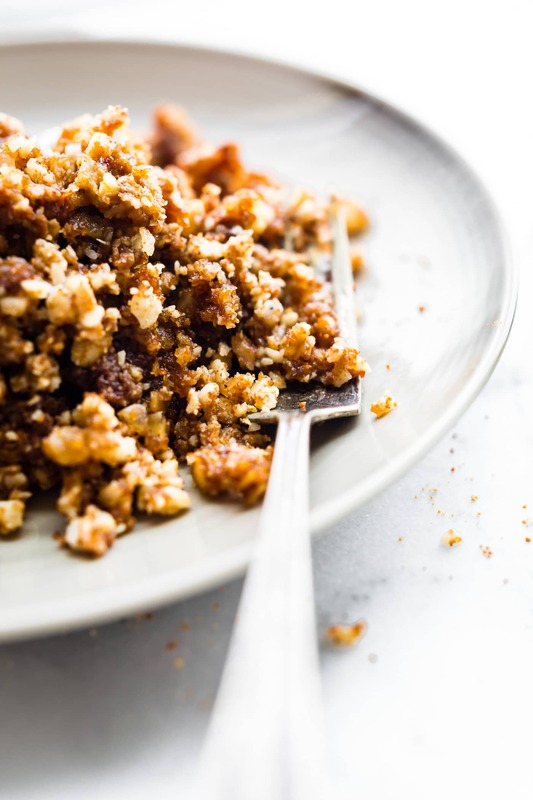 If you are using coconut oil in the crumble, add a 1 tbsp at a time so the crumble keeps it’s texture. Only 1 or 2 tbsp should be sufficient. Too much oil can turn the crumble into a thick batter. I suggest using ghee or non dairy butter if possible for dairy free option. Estimated Nutrition will vary depending on if using coconut oil or clarified butter. Nutrition shown based on using coconut oil. And lastly, I could not leave you without a NERDY NUTRITION TIP! Did you know that nuts are high in zinc? 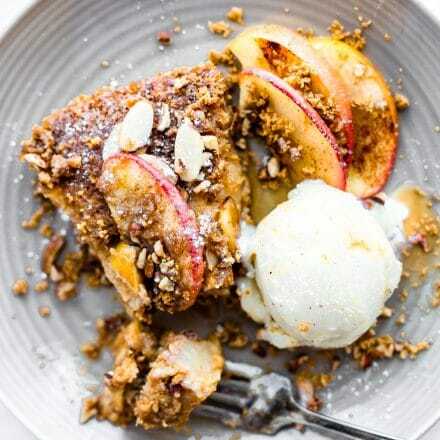 Like the almonds found in almond flour and the macadamia nuts found in that buttery crumble. And obviously pumpkin and sweet potato are high in Vitamin A. Together they create SYNERGY. Why? Because Zinc carries a protein that helps transport Vitamin A to make retinal. A molecule that is necessary for color-vision. So basically, this pumpkin sweet potato casserole will make you SEE all the COLOR in life. Ha! You’re welcome. Now grab a spoon and keep your eyes on the prize. Oooh forwarding this recipe on to my mom… I don’t have the biggest sweet tooth, but she loves all things sweet potato / casserole!! 😉 Hugs, Lindsay! Oh that’s awesome Sarah! Let me know if you do! Invite me, LOL! I’m saving this for Thanksgiving! It sounds amazing and we definitely need a healthier side on the table! for sure! evens out the pie, right? LOL! 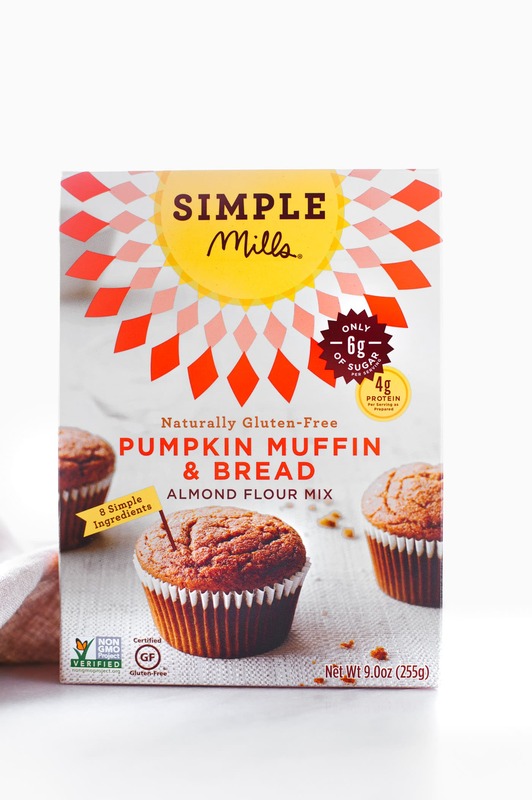 I have tried some of simple mills products and love them but haven’t tried their baking mixes. I neeed to get my hands on this so I can try this recipe!!!! aren’t they the best?!! You gotta try the almond flour mixes, for sure! yep, my thoughts exactly. I didn’t like all the sweetness and marshmallows. ICK! this taste like mac nut pumpkin pie. You’d love bro! Macro diet approved, yes? LOL! Oh I have the same rule about pumpkin – not until October 1! But hooray – here we are. And you’ve got this gorgeous, re-vamped casserole for us! I think this looks amazing! and I can’t believe it’s Paleo!? Thank you Hawaii for the macadamia nut inspiration! Yum! Just used macadamia nuts this morning 🙂 i LOVE THEM and this recipe is off the hook! I JUST made sweet potato casserole last week! The macadamia nuts in here are BRILLIANT friend! I love the use of Simple Mills too! for sure! love all their mixes! 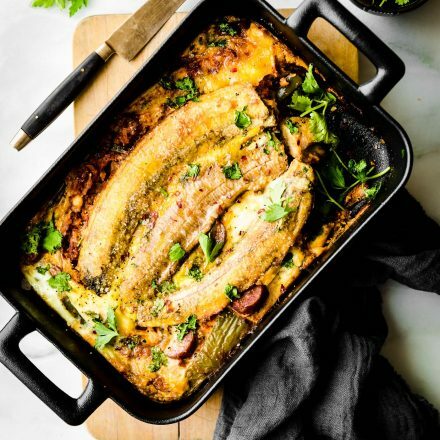 im not a huge fan of casserole type dish but you are convincing me to try this! Yea! So glad I could convince. haha! I am loving this combination together!! I’m going to add this casserole to my list of things to make for Thanksgiving this year! Oh and your casserole dish is super cute! This has me so PUMPED for fall cooking!! My mom makes an amazing sweet potato casserole for the holidays, but we might need to change it up this year and add this one too. Love that nut topping! Goodness! I love that nutty, crunchy topping! My kids normally shy away from sweet potato casserole, but I think they would be all over this recipe! 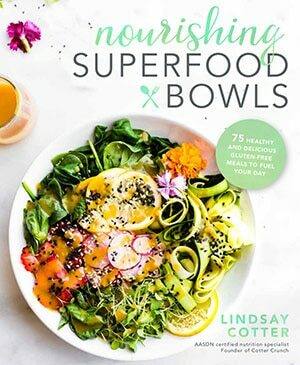 I bet this one is a total hit at your family’s table Lindsay! We always have a sweet potato something for the holidays, so I’ll need to give this a try! I bet we’ll love the lighter version too! Oh you can totally use chickpea (aquafaba). I think that would work! I’m melting over that topping Linds! OMGeeee! All of this and that almond mix from Simple Mills looks scrumptious! I looove how good pumpkin and sweet potatoes are so good for us… growing up, our spc was loaded with marshmallows and sugar… tons of brown sugar. I’ve since made it healthier…. but you’ve shown me the way here! Brilliant! p.s the marshmallows.. haha how did that southern style dish even begin. LOL! Another wonderful recipe, and I LOVE the inclusion of macadamia nuts. They’re one of my favorites. Also I appreciate you holding off on pumpkin until October. I didn’t think it was possibly but I think even more of you now. You’re the best. haha well i appreciate you more for reading that whole comment. LOVE YOU!